Strawberry season is over for 2018. Thanks for coming out. Hope to see you late September thru October for Lots of Fall Fun, Pumpkins, Hayrides on the EAST Frontage Rd. just north of McDonalds at the Farmhouse Ice Cream Parlor. Because we depend on mother nature to ripen the strawberries the beginning of each season may vary. The strawberry season can start anytime from the 1st week in June to the last week in June. Once the season starts it will last about 3-5 weeks. It is important to call ahead in the beginning of June to get an idea of when the season will start. 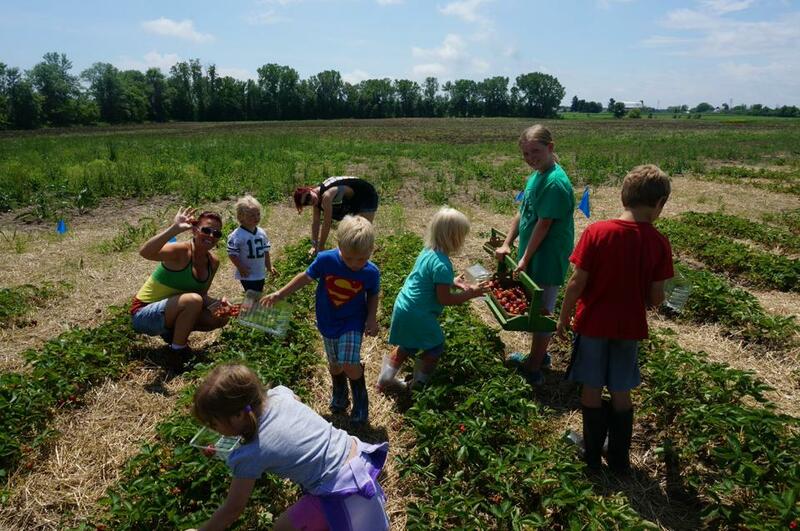 Call BerryLand: (920) 826-7297 for up-to-the-minute information on picking times, what is in season, to order pre-picked or to arrange a Haunted Hayride for your school group or club. Bake pie shell. Mash enough berries to measure 1 cup. Stir together sugar and cornstarch and dissolve in berry juice or water. Add crushed berries. Cook over medium heat-stir constantly, until mixture thickens and boils and is clear. Cool. Spread softened cream cheese on bottom and sides of pie shell. Fill with fresh berries. Pour cooled glaze over berries. Chill 3 hours until set. Top with real sweetened Wisconsin whipped cream and a fresh berry-our favorite!!! Use cold butter/margarine cut into small pieces and add the brown sugar, flour, oats and nuts. Mix up with a fork so stays crumbly. Put into 9X13 inch pan and pat smooth. Bake at 375° for about 10-12 minutes. Let Cool. Blend 8 oz. of softened cream cheese with 1 cup powdered sugar & 1 Tbsp. lemon juice. Fold in 1 1/2 cups Cool Whip. Spread on cooled crust. Put 2 cups of cleaned, crushed BerryLand strawberries in a saucepan with 2 cups of sugar. Stir 6 Tablespoons of cornstarch into 1 cup berry juice or water. Stir this into the berries and sugar. Cook and stir till thick, dark, clear and bubbly. Boil and stir for at least a minute or more. Cool. When cool -spread on top of the cream cheese layer. Chill. When serving top off with Real Wisconsin Whipped Cream! Arrange six (7 inch) flour tortillas cut into 8 wedges on baking sheets; lightly coat with butter-flavored cooking spray. Sprinkle evenly with 2 tsp. of a cinnamon/sugar mixture. Bake at 400 degrees for 7 minutes or until crisp. Cool. To serve: arrange 8 tortilla wedges on a serving plate; top with 1/3 strawberry mixture and 2 1/2 Tbsp. sour cream mixture. Sprinkle with 2 Tbsp. sliced toasted almonds and 2 tsp. shaved semi-sweet chocolate. For more great recipes, visit BerryLand today and pick up our recipe brochure at check out! !